Get ready to shop till you drop with your group while seeing all the best sights San Antonio has to offer because this 2-day shopping getaway is going to be EPIC. This beautiful riverway is lined with businesses, restaurants, hotels, attractions, and other services to make it the most inviting and entertaining district in the city. You might not want to leave once you get a taste of the glorious personality of the San Antonio River and the shopping you can find here. Boutiques and shops are sprinkled throughout the walk, spicing up the area with specialty shops and local flavor. Nearby is the Rivercenter Mall for more in-depth shopping, located only minutes away. If you get hooked by the Southwestern flavor of the Riverwalk, you might want to step into one of the magnificent dining establishments. Dine by the riverside or in the air-conditioned venues to the sound of live music as friendly waitstaff serve up the most delicious cuisine from all over the world. An entertainment, fashion, and food destination, the Rivercenter Mall is an all-in-one stop for premier shopping and a night on the town. With four levels, each separated into their specified use, the mall is compartmentalized into granting a clearcut entertainment experience where everything is easy to find and in its place. Enter from the River Level and marvel at the water-filled courtyard, reminiscent of grand old world Spanish villas. Don’t miss the 1,000 room Marriott attached directly to the side of the mall as it towers above the premises. On the lowest level, you can find a myriad of restaurants and counter service food kiosks such as Tony Romo’s, Little Tokyo, Chili’s, Marble Side Creamery, and Tutti Frutti among others. From there, travel to the Street Level and find accessories, shoes, fine jewelry, and more. If you’re searching for apparel, head up one floor to the Fashion Level and peruse your way through favorites like American Eagle, Aeropostale, Express, Hot Topic, Macy’s, and Buckle. The fun doesn’t end with shopping and dining, however. With the true spirit of the Riverwalk, Rivercenter Mall is also home to an IMAX theater and an 11 theater AMC on the top floor Entertainment Level. For one of the most unique and relaxing ways to see the river head for the GO RIO dock on the Riverwalk. GO RIO is the newest river cruise experience in San Antonio and provides narrated public tours departing every 15 to 20 minutes, 9 am to 10 pm. Student groups can also reserve a chartered cruise, with space for up to 40 people on board. The barges themselves are colorful and eco-friendly, providing a safe and educational way to get some fresh air and learn along the River Walk! Arguably the most popular attraction in all of San Antonio, the Tower of the Americas is a must-visit for your group. This 750-foot icon located downtown holds an observation deck, revolving restaurant, bar, and even a 4D Adventure Ride (Skies over Texas).See Flags Over Texas on the observation deck, this platform level providing the absolute most stunning view of the city. Head to Chart House for some seriously legendary dining with unbeatable views, or grab a cocktail at Bar 601: Happy Hour. The Tower Cafe and Gift Shop are located on the same level as the observation deck, and you can also begin self-guided tours of the tower here, just make sure you see all the Texas historic murals while exploring! This stop will give your group the ultimate sightseeing, dining, learning, and photographic opportunity, so don't miss out! 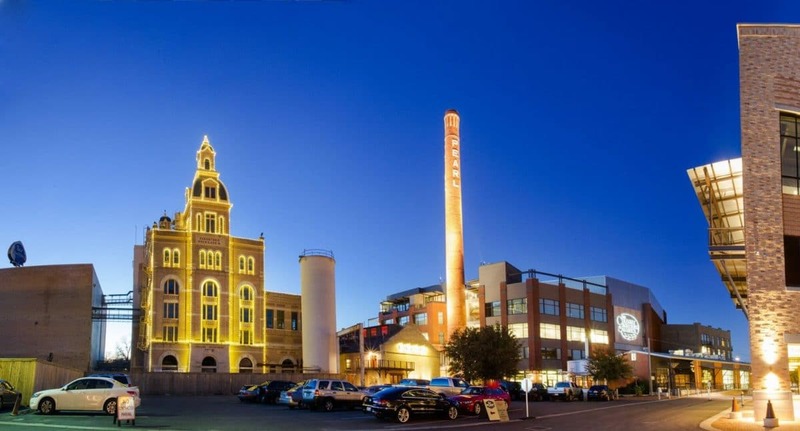 Welcome to San Antonio's Pearl District, the hottest culinary and cultural destination in the city! This dynamic and constantly evolving environment allows guests to 'eat, play, and learn along the banks of the San Antonio River', a perfect place for your group to explore and get to know the city a little better! While here you can do everything from learning to bake at french authentic Bakery Lorraine to enjoy live local events and concerts. There are fine dining options, places to shop for unique goods, and even a weekend farmer's market here! If you happen to be visiting during a Saturday or Sunday you must set aside extra time here to visit the Farmers Market, with fresh, local, and seasonal treats from over 45 different local vendors. Find fresh meat, produce, eggs, baked goods, olive oils, fresh cheeses, and prepared foods here, each product a 'true representation of Southern Texas ranching and artisanal food communities'. This 3-block outdoor plaza is considered to be the largest Mexican market in the United States, with over 100 locally owned and operated shops and stalls throughout. The 'sights and flavors of old Mexico' are well represented in this festive indoor/outdoor mall, with items such as authentic Talavera pottery and other exotic curios similar to this sold throughout. The products represent and celebrate the cultural, artistic, and ethnic influences of the Southwest and Mexico, and you will find everything from clothes to wood carvings and local candies. Your group will have a chance to taste authentic Mexican cuisines at restaurants such as Mi Tierra and La Margarita, and there is also the Food Court at the Farmers Market Plaza, which consists of over 80 stalls, shops, and working artists. 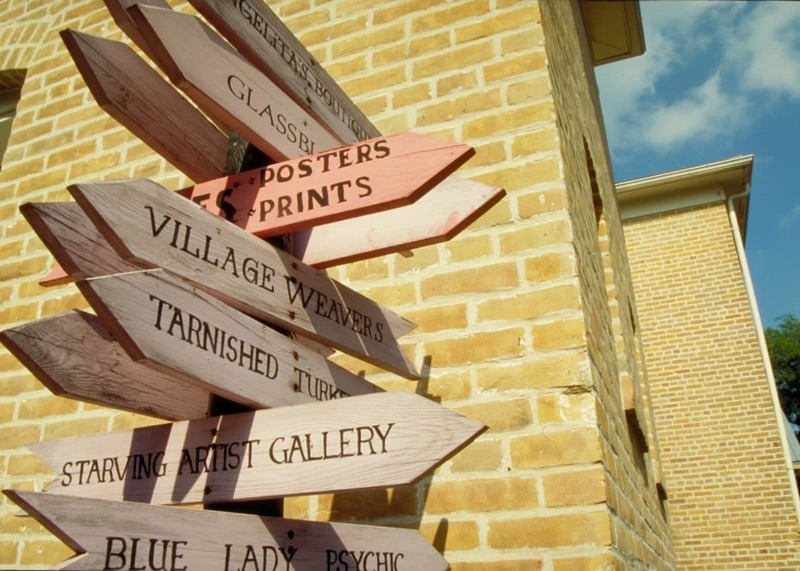 This 16 acre, 1 square block area holds galleries, stores, and gift shops featuring various pottery, jewelry, Mexican Folk Art, and much more. There are also several authentic (and really delicious) eateries around the area as well. The entire conglomerate of 'romantic courtyards, spacious plazas, and historic architectural types' really combine to create one of the most charming spots in all of San Antonio. Be sure to set aside plenty of time to sightsee, brush up on local history at the various historic buildings, shop at such stores as Besarte and Bird and Pear, and eat some of the most delicious foods in downtown San Antonio. America's #1 Flea Market, Trader's Village, sits on over 100 acres and holds over 1,000 dealers/merchants each weekend. You can come in and browse, buy, and trade in the open-air market venue, which is actually considered to be the largest weekend flea market in Texas! Find everything from jewelry and clothing to truck accessories and tools! There are also various midway rides and games outside, plus plenty of eating options! Traders Village San Antonio is a swap meet, treasure hunt, shopping complex, county fair, and festival attraction all rolled into one.